Cat’s Pride® Fresh & Light™ cat litter is being promoted in the USA in a television advertising campaign featuring anthropomorphic animated cats. use Fresh & Light™ cat litter to help one another and their owners through life. Two fully CG photo-realistic cats had their actions formed by two real cats filmed over two days, after training for four weeks under the same animal trainer that had worked on Harry Potter movies. The Cat’s Pride campaign was developed at Doner, Detroit, by chief creative officer Rob Strasberg, creatives Randy Belcher and Rob Dey, and agency producer Stuart Moutrie. Filming and post production were produced at MPC by director Jake Mengers, director of photography Simon Richards, executive producer Jeremy Smith, line producer Elizabeth Trustrum, post production producer Paul Branch, VFX supervisors Christopher Antoniou, Fabio Zaveti, 3D production manager Stefano Salvini, VFX artists Ajai Verghese John, Andrea Falcone, Andrew Brooks, Anthony Bloor, Benjamin Syiem, Charlotte Tyson, Chrys Aldred, Dameon Boyle, Daniel Kmet, Dominic Edwards, Fabio Zaveti, Heather Goodenough, Inigo Vimal Roy, Jason Brown, Jason Ivimey, Robert Hesketh, Kunal Sarkar, Maurizio De Angelis, Megha Thakar, Neil Griffiths, Prashant Nair, Raju Ganesh S, Remi Cauzid, 3D editorial team Franck Matellini, versioning team Alex Lovejoy and Louisa Cartwright, and colourist Jean-Clement Soret. Editor was Rich Orrick at Work Post, London. MPC Creative shot all live-action plates on a two-day shoot in London. To ensure the right actions and reference of the cats were achieved for postproduction – which focused on rigging, modeling, texturing and animating two fully CG photo-realistic cats under VFX supervisor Christopher Antoniou – two real cats were trained for four weeks under the same animal trainer that had worked on Harry Potter movies. With the necessary frames in hand, MPC’s VFX Team set out to fully animate the cats. To accurately depict the cat’s comedic movements, it was important for the team to find the right balance between cat and human characteristics. 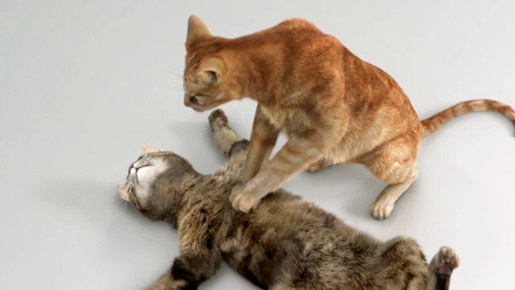 The team took advantage of the resources readily available in-house and used the custom animation packages developed for film to animate and render the cats. MPC used its proprietary Furtility software, which enables amazingly detailed custom hair work, for grooming. The studio’s New York office finished the spot in Flame and delivered the final playout. Director of Color Grading Jean-Clement Soret carried out the color grade.